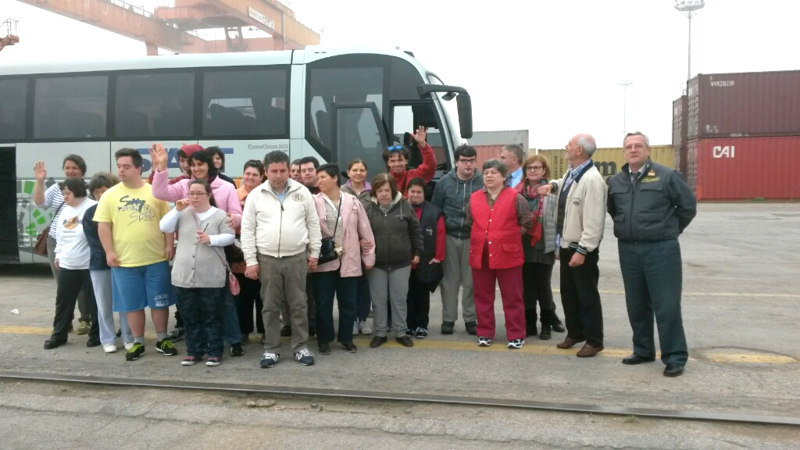 On Wednesday May 6th TCR had the opportunity to welcome a group of differently abled people for a visit to the terminal, an event organized by the cooperative “La Pieve”. La Pieve is a social cooperative deeply connected with the territory, trying to address the needs of differently abled people and their families through an integrated offer of services that includes rehabilitation and working opportunities; part of the program is concerned with visits to companies active on the territory, and their productive sites. Both TCR’s external supervisor Antonio Spataro and the commander of the local section of the Guardia di Finanza, Arcangelo Di Donato, welcomed the guests, as the group guides witnessed genuine emotion right from the start. Throughout the tour, terminal staff made it possible for the guests to enter the operational areas and observe firsthand the activity of the enormous Ship-to-Shore cranes, an experience that generated a large interest due to the out-of-ordinary size of the equipment and the technology employed. This was also a significant experience for the TCR supervisor, Mr. Spataro, who often escorts the groups of students visiting the terminal in the context of the Porto Lab project: “I’ve never been asked so many questions about the port, the ships, the containers and the equipment!"